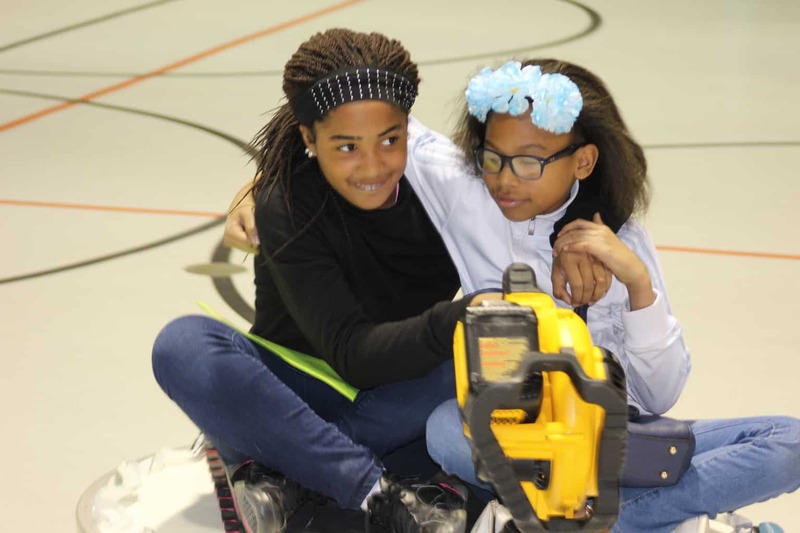 Prior to the day of the Hovercraft Project, students were placed into groups of 6 and 7. A leader was chosen, and each student was assigned one or more jobs (I’ve added the link to the page with the descriptions so you can see what was expected). On the morning of April 30, students arrived in the gym around 8:45 to get started! The Hovercraft leader, Matthew Chase, spoke with them about the importance of failure, inquiry, and trying again. He also imparted a great lesson about how each of us is valuable, despite weaknesses and what other people think. It was a great lesson. He also told them they’d likely be frustrated as the day proceeded, but encouraged them to carry on. After that, each group created a name and a flag. My favorite was Dabberwocky – after our class love of dabbing and the poem “Jabberwocky” by Lewis Carroll. Adults were instructed NOT to help, only to ask more questions so students could figure out how to put together the hovercrafts as a group. Group leaders were given instructions that they took back to their respective groups. The first task was creating the largest perfect circle possible on an irregularly-shaped piece of plastic tarp. This took the longest of any of the tasks, as students had to use the few materials provided to them. The way the jobs are assigned, each member must contribute in order to get everything done. There was frustration, but no group gave up! Adults had to check that the circles were large and perfect, and students had to explain their reasoning and prove that they’d created perfect circles. Over the course of the day, the students all successfully built their hovercrafts. Ironically, the group who finished construction last won the first challenge of which hovercraft went the farthest! The students engaged in several experiments, changing variables such as how many kids were on the crafts, how many pushers, how tight/loose the skirt was, etc. All the data was collected, and each group learned which variables created the fastest, farthest rides. They forgot their frustration of the morning, and had a blast. Working hard up front to have a great finished product later was a lesson learned by all. I was impressed by how well the kids worked together, and had to really control my instinct to jump in and help! I think everyone learned something about him/herself on that day.